In her Cathedral of Our Lady of the Sign (Znamenia Cathedral), 75 East 93rd St. But she travels a lot, visiting her Russian Orthodox children all over the world. To make sure she is home check her schedule here or call the cathedral at (212) 534-1601. 13th century, about 18 inches high, painted icon with precious metal, enamel cover. For more on her original home see Kursk in this index. 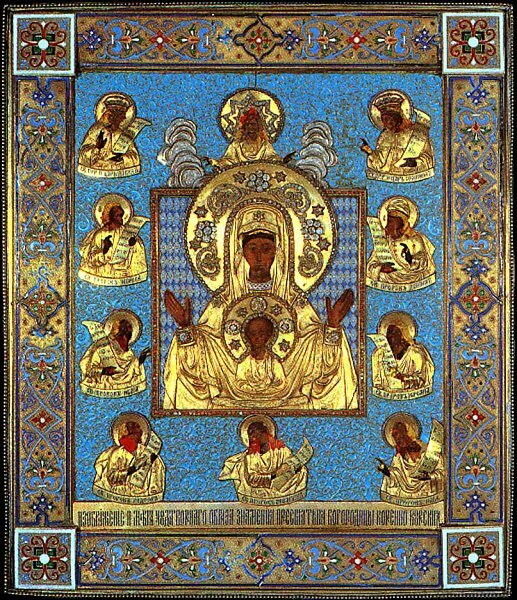 I include the Kursk Root icon in this index for three reasons: 1) because she shares so many characteristics with Black Madonnas. 2) because North American lovers of the Dark Mother should avail themselves of any opportunity to meet her in person. 3) in gratitude to people like a certain David, who brought this Madonna to my attention. Kursk is the city in Russia near which this icon was found. ‘Root’ recalls that she was found at the root of a tree, as will be explained below. But I think there is a deeper meaning that echoes in this title – something to do with the Mother of God being our root, our mother who came from the earth and grew into the Divine. In the "Hail Queen of Heaven", a famous Marian prayer, Mary is simply addressed with "hail root and gate..." Certainly to her Russian Orthodox children the Kursk Root icon also represents their roots in Russian soil. Mother of God of the Sign is a very common type of Orthodox icon of Mary where she is depicted in the ancient posture of prayer (standing and with arms outstretched) while carrying Jesus within her. To me, this perfectly exemplifies what we are to do in meditation: know that God is in you and let go of everything else in perfect surrender. In the 13th century, during the dreadful period of the Tartar invasion of Russia, the devastated province of Kursk was emptied of people and its principal city, Kursk, became a wilderness. Now, the residents of the city of Rylsk, which had been preserved from invasion, often journeyed to the site of Kursk to hunt. One of the hunters, going along the bank of the river Skal, noticed an icon lying face down on the ground next to the root of a tree. No sooner had he picked up the sacred image than there immediately gushed forth with great force an abundant spring of pure water. This took place on September 8th, the feast day of Our Lady’s birthday, in the year 1295.The hunter constructed a small wooden chapel and placed the newly manifested image of the Mother of God therein. The residents of Rylsk began to visit the place of the manifestation of this holy object and the icon was glorified by more miracles. So many of the miracles involved the spring and another 7 healing springs nearby that I would call the place the Lourdes of Russia. Soon Prince Vasily Shemyaka of Rylsk ordered that the icon be brought into the city of Rylsk. This was done in a solemn manner, with the people of the city going forth to meet the icon of the Mother of God; but Shemyaka himself declined to attend the festivities and for this reason he was punished with blindness. Realizing his mistake, he repented and straightway received healing. Moved by this miracle, Shemyaka constructed a church in the city of Rylsk in honor of the Nativity of the All-Holy Theotokos (Mother of God), and there the miraculous icon was enshrined on September 8th, the day of its manifestation, appointed as the annual feast date. However, as so many Black Madonnas, she had a will of her own and kept miraculously returning to the place of her appearance. The residents of Rylsk continually brought her back, but each time she returned to her former place. Then, understanding that the Mother of God was well pleased to dwell in the place of the manifestation of her image, they eventually left her there in peace. Innumerable pilgrims streamed to the site and services of supplication were celebrated there by an ascetic priest called Bogoliub, who lived next to the wooden chapel. In the year 1383, the province of Kursk was subjected to a new invasion of Tartars. They decided to set fire to the chapel, but it refused to burn, even though they piled up fuel all around it. So the Tartars accused the priest Bogoliub of sorcery. The pious priest denounced their foolishness and pointed instead to the will of the miraculous icon. That that, the malicious Tartars laid hold of it and cut it in two, casting the pieces to either side. The chapel then caught fire and the priest Bogoliub was carried off a prisoner. In his captivity, the God loving man placed his hope in the all-holy Mother of God. One day, as he was guarding flocks and passing the time by singing prayers and doxologies in honor of the Mother of God, some emissaries of the Tsar passed by. They heard this chanting, arranged to ransom the priest from captivity, and Bogoliub returned to the former site of the chapel. There he found the pieces of the miraculous icon which the Tartars had cast away. He picked them up and straightway they grew together, although the signs of the split remained. Learning of this miracle, the residents of Rylsk gave glory to God and to His all-pure Mother. Again they attempted to transfer the holy icon to their city, but once more the miraculous image returned to its former place. A new chapel was then built on the original site of the icon's appearance and here it remained for about 200 years. The city of Kursk was revived in the year 1597 at the command of Theodore Ivanovich of Moscow. This pious Tsar, who had heard of the miracles of the icon, expressed his desire to behold it. So it was brought to Moscow, where it was greeted with great solemnity. The Tsaritsa, Irene Theodorovna, adorned the holy icon with a riza (a precious metal cover to protect and adorn an icon). At the command of the Tsar, the icon was set in a silver-gilt frame upon which were depicted the Lord of Hosts and prophets holding scrolls in their hands. The icon was subsequently returned and, with the close cooperation of the Tsar, a monastery was founded on the site of the chapel. A church, dedicated to the Life-bearing Spring, was built above the spring that had appeared when the icon was first revealed. The monastery attached to it was called the Kursk Root Herrnitage in honor of the manifestation of the icon at the root of the tree. During the next war, an invasion of Crimean Tartars, the icon was transferred to the cathedral church of Kursk, and an exact copy was left at the Hermitage. Tsar Boris Godunov bestowed many precious gifts for the adornment of the icon and even the pretender, the false Dimitry, who desired to call attention to himself and to win the support of those who lived in the vicinity of Kursk, venerated this icon and placed it in the royal mansions where it remained until the year 1615. While the icon was absent from the city of Kursk, the grace-bearing aid of the Mother of God did not forsake that city, for when in the year 1612 the Poles laid siege to Kursk, certain of the citizens beheld the Mother of God and two radiant monks above the city. Captured Poles related that they too had beheld a woman and two radiant men on the city walls, and that this woman made threatening gestures at those who were conducting the siege. The besiegers were quickly put to flight. In gratitude the citizens made a vow to construct a monastery in honor of the all-holy Theotokos and to place the miraculous icon therein. In March of 1898 a group of anarchists, desiring to undermine the faith of the people in the wonderworking power of the icon, decided to destroy it. They placed a time bomb in the Cathedral of the Sign, and at two o'clock in the morning a horrendous explosion rent the air and all the walls of the monastery were shaken. The frightened monks rushed immediately to the cathedral, where they beheld a scene of horrible devastation. The force of the blast had shattered the gilded canopy above the icon. The heavy marble base, constructed of several massive steps, had been jolted out of position and split into several pieces. A huge metal candlestick which stood before the icon had been blown to the opposite side of the cathedral. A door of cast iron located near the icon had been torn from its hinges and cast outside, where it smashed against a wall and caused a deep crack. All the windows in the cathedral and even those in the dome above were shattered. Amid the general devastation, the holy icon remained intact and even the glass within the frame remained whole. Thinking to destroy the icon, the anarchists had, on the contrary, become the cause of its greater glorification. At the end of October 1919, when the White Russian Army was evacuating the city of Kursk, twelve monks of the monastery took the icon from city to city until she ended up aboard a ship to Greece. From there she went to Serbia, back to Russia, back to Serbia and from there all around the Russian Diaspora: from Yugoslavia to Austria, Czechoslovakia and finally to Germany in the spring of 1945. The holy icon proved to be an unending consolation to many thousands of people who were experiencing all the trials and tribulations of the latter years of World War II. From Munich the icon was borne to Switzerland, France, Belgium, England, Austria, and many cities and camps in Germany itself. In 1951, the icon was transferred to the New World where it had its permanent residence first in the New Kursk Hermitage in Mahopac, N.Y., and then in the Synod's Cathedral Church of the Mother of God of the Sign in New York City. At present, a festival is held in honor of the icon at the New Kursk Hermitage in Mahopac, N.Y., on the Sunday nearest the feast of the Nativity of the Most Holy Theotokos, and in the Synod's Cathedral of the Mother of God of the Sign in New York City on November 27/ December 10. Meanwhile in Russia, since 1618 to this day, every year (political circumstances permitting) on Friday of the ninth week after Russian Orthodox Easter, the icon of the Sign (or a copy of it when it is in the Diaspora) is solemnly borne in procession from the Kursk Cathedral of the Sign to the place of its original manifestation at the Korennaya (i.e. Kursk Root) Hermitage in Soboda Village (about 30 km from Kursk) where it remains until September 13th. Then it again is solemnly returned to the Kursk Znamensky Monastery for the winter. In the year 2005, 30,000 Russians attended the ceremonies. The Mother comforts her children in Australia. Since its miraculous appearance in the forest of Kursk in the 13th century, the wonderworking icon of the Mother of God of the Sign, has been a constant source of healing, comfort and deliverance from calamity to countless numbers of Orthodox Christians. With its departure from the Russian land following the defeat of the White Army, the icon continues its miraculous aid in all the countries it is carried to. A book entitled The Hodigitria of the Russian Emigration, authored by Bishop Seraphim (later Archbishop of Chicago and Detroit, now reposed), was published in 1955 (in Russian), giving a lengthy account of the history of the Kursk icon and the miracles performed by it. In 1976 Archbishop Seraphim issued a supplement to this book, containing more recent accounts of miracles which he had gathered in the course of some 20 years. A couple of themes in the long stories told on the website strike me: the aspect of the Mother of God which is present through this holy icon often doesn’t heal people directly or instantaneously. Instead it works in conjunction with humans. She seems to demand their cooperation in the effort to heal. The most famous example is Saint Seraphim (born Prokhorus Moshnin) who was born in the city of Kursk in 1759. At the age of 9 Prokhorus became so ill that he wasn’t expected to recover. Just at that critical time, in his sleep he had a vision of the Most Holy Mother of God promising to visit and heal him. Next time the wonderworking Kursk-Root Icon was carried in procession through Kursk, it went through his family’s property. His pious mother Agathia took her sick child in her arms and carried him out to the Mother of God. The boy kissed the Icon and, soon after, he completely recovered. (*3) Of course the Queen of Heaven could have healed him in the initial vision in the dream, but she wanted someone to bring her icon near him and his mother to carry him to her. Only then did she grant healing. Similarly Galina Alexandrovna, was healed in 1949 only after her fiancée Sergei Shenuk found a way to bring the Kursk Root icon to her hospital room, ceremonies were performed, and with that the patient improved to where a necessary operation could be performed. She lived, married Sergei, and became pregnant only with divine intervention after 4 years of not being able to conceive. In 1963 her husband became seriously ill and was in and out of hospitals for 1 ½ years. The doctors couldn’t find a way to heal him. Finally the miracle-icon made it to his bedside and he knew all would be well. But it still took a friend visiting and coming up with a new treatment idea that the doctor in charge wanted to reject but found himself accepting instead (all by divine influence). Again the patient only recovered to where an operation was finally possible. Only after that did she become completely well again. – Fascinating how Holy Mary made the fiancée take a vow for life. She needs us to do our part. It is not minor and sometimes making deals with God really works! *1: For a great website about other miracle working icons of black and white Madonnas in the Russian Othodox church click here. *2: As told on the Russian Orthodox websites orthodoxwiki.org and fatheralexander.org. I edited the text some. In the Basilica of Guadalupe, 1531, almost life size, painting on a coarse poncho of woven cactus fibre. In 1531 things were looking dismal in Mexico. In the course of ten years millions of native Mexicans had been killed by the brutality of the Spanish Conquerors and their diseases. Though a few Mexicans had converted to Christianity no sign of a lasting peace was in sight. "My dear little son, I love you. I desire you to know who I am. I am the ever-virgin Mary, Mother of the true God who gives life and maintains its existence. He created all things. He is in all places. He is Lord of Heaven and Earth. I desire a temple in this place where your people may experience my compassion. All those who sincerely ask my help in their work and in their sorrows will know my Mother's Heart in this place. I am your merciful Mother, the Mother of all who live united in this land, and of all humanity, and of all those who love me, of those who cry to me, of those who have confidence in me. Here I will see their tears; I will console them and they will be at peace. So run now to Tenochtitlan (Mexico City) and tell the bishop all that you have seen and heard." Of course, the bishop didn't believe Juan Diego, probably thinking: "I know who appears on that hill!" So the Aztec returned dejected to his Mother and asked her to send somebody of rank to whom the bishop might listen. But she sent him back to the bishop with the words: "My son, there are many I could send, but you are the one I have chosen." The shepherd wasn't too happy to see his sheep back so soon on the next day and insisted that he needed a sign as proof of the identity of that princess. Our Heavenly Mother granted the sign on the morning of December 12. She ordered Juan Diego to collect flowers from the summit of Tepeyac. Where there were usually only brambles, there now bloomed Spanish roses and other extravagant flowers. The man gathered as many as he could into the fold of his poncho and brought them to the Virgin. She arranged them carefully in his garb and sent him off to the bishop. When, after trials and tribulations, the poor Aztec was finally allowed into the presence of the church man, he unfolded his poncho. The flowers fell to the ground, revealing the perfect image of Our Lady of Guadalupe. As they say, the rest is history. The divine Mother got her temple, performed many miracles, and within seven years eight million Aztecs converted to Christianity. Spaniards and native Mexicans became one people of mixed blood and heritage under one Mother. To them she is mixed like her children: a synthesis of Christian and Aztec Heavenly Queen. In her portrait Guadalupe doesn't look very dark, but she is called Morenita because in the apparition she showed herself dark and beautiful as an Aztec princess. In her conversations with Juan Diego she stressed her close relationship to his people: "Do not be distressed my dear son. Am I not here with you who am your Mother? Are you not under my shadow and protection? Am I not of your kind?" The type of poncho Juan Diego was wearing usually disintegrates within ten years, but this one has lasted for 500! Even a high quality canvas is usually primed with a layer of gesso to protect the canvas from the paint and provide a smooth surface, but this perfect masterpiece was applied straight onto the coarse fiber. In the state of Oaxaca, about 4 hours Southeast of Oaxaca City, 16th century, about 30 cm natural wood with burn marks from a fire. originally: the Most Pure Virgin of the Conception of Amialtepec. There are several versions of the legend of this Dear Dark One. The most common one claims that her first known owner was a Dominican priest called Frey Juan Jordán de Santa Catarina. He was the first to bring Christianity to the state of Oaxaca. Some say he brought this statue from the Philippines, which would explain the oriental hair do under her wig. He kept this little figure on his personal altar until he moved on to another area in 1558. The monk had an indigenous house servant who was from Amialtepec and who had a great love for this Morenita. Upon his departure the priest gave the Madonna to his faithful, young servant. The humble peasant kept her on an altar in his hut and that's where she first began to perform miracles. Once she was recognized as a miracle worker, her fame quickly spread. 75 years later, in 1633, the Church authorities took notice of this Virgin so well loved among the Indians. Seeing that her owner was well advanced in years, the clergy decided it was time to build a church for her. Only that way could they ensure that the image would be surrounded by a truly Christian cult and that the offerings people had been leaving to her would be used appropriately. The old Indian servant was at first opposed to this idea, but somehow he was persuaded to let the Dark Mother move out of his hut and into a Christian temple. In those days, every winter the locals would burn their fields in preparation for spring sowing. One year a great wind suddenly whipped the fire out of control and it consumed the whole village, including the church. The villagers barely got away with their lives. When they returned to see if the fire had spared anything, they found the only surviving object in the church and the village was the Most Pure Virgin standing on her sculpted agave plant, on which she still abides today. The fire stained her face dark, owning her the title Morenita. With her miraculous survival in the flames the Black Madonna's fame spread even more. Apparently this led the priest in the nearby town of Juquila to covet the famous statue. His name was Jacinto Escudero and he announced that the Virgin really should reside in a larger, more dignified, and more accessible church - i.e. his own. Again her owners did not want to let her go, but were somehow "persuaded". However, it seems that Our Lady also wanted to stay with the simple folk in the mountains and so, the night after she had been brought to Juquila, she stole back to Amialtepec. The Indians were punished for stealing her, she was brought back to Juquila and guarded day and night. Still, she escaped again and returned home. Now tension between the two towns rose to dangerous levels as she was ordered back to Juquila for a third time. Extra guards, chains, and locks were installed. But the Mother of God was not going to be chained down. In a flash of light she was back with the villagers. With that the priest finally saw the error of his ways, he relented, and the people's fervor for their Dark Mother doubled. Because of the violent and stubborn way in which Jacinto Escudero had handled the whole situation he was transferred to Guadalajara. Unfortunately, after a while he forgot the powerful signs the Virgin had worked in order to make her will known. In his conceit he pitted the Church against the Queen of Heaven, asking the bishop of Oaxaca to move Our Lady back to Juquila. And so in 1719 the bishop talked to the people of Amialtepec until they finally gave into his insisting request. They expected their Mother to miraculously return to them a fourth time and as often as was needed, even if they allowed her to be brought to Juquila. In order to show their good will they even participated in a great, solemn procession escorting her with much pomp. Unfortunately they were disappointed. The gentle Mother did not wish to fight her Church any longer. She tries to teach her children, but she can't force the clergy to learn. We're not sure what exactly happened next; the historical records burnt in a fire. But somehow many people died in the church during the Morenita's first days in Juquila. Some think there was fighting, others say many who entered were struck by a plague of sorts, caused either by natural or supernatural powers. Nonetheless the image remained there and gradually people accepted the Mother's new home. She appeased them by continuing to work miracles in both her old and new domicile. Her children learned how to honor her in both places. This is what they do to this day: For the thousands of pilgrims who come to Juquila every week their visit starts in Amialtepec, 9 kilometers before Juquila. There they go to the chapel of 'El Pedimento' (the request), a shrine high on a hill near the original site. The ground around El Pedimento is dense clay, which is considered sacred and is said to have healing properties. People use this clay in various ways. Some rub their faces with it, some eat it, but most use it to give shape to their requests. As God created the earthling (Adam) out of clay so the children of God co-create their dreams. They sculpt little clay houses, cars, farm animals, food, husbands, body parts that need healing, anything they want…. Then they attach a message addressed to the Virgin and lay their "request" at the feet of a large ceramic copy of the Black Madonna. On their return the following year they bring a cross with some type of sign on which they give thanks for the granting of last year's favor. So popular is this shrine that each day a caretaker hauls all of the offerings, requests, and crosses out back, forming an enormous holy dump pile. Having finished at El Pedimento, the pilgrims continue to Juquila. Many crawl the last two kilometers, from the entry area to the actual statue, on their knees. They make their way along a dirt road that leaves their knees bloody upon arrival. Once at the feet of their Mother, many pilgrims make a promise, vowing something like: "If you get me safely to the USA I will come back here to give you thanks when I return to Mexico." Or: "If you grant me a child I will make this pilgrimage three more times in my life." The feast day of the Morenita of Juquila is December 8th. On any given day "you'll pass hundreds of pilgrims on foot and bicycle, some camping out for days, even months. You'll wind among truckloads of the faithful packed under tarp-covered pickups, forming a kind of modern-day wagon train. "(2) On her special day the roads become particularly jammed. The occasion is celebrated with a fair, fireworks, sporting events, indigenous and contemporary dances. In the village Suyapa, 7 km SE of the capital Tegucigalpa, in the old little church behind the new basilica and on special occasions inside the basilica, 6.5 cm, painted cedar wood. On February 3, 1747 the young peasant Alejandro Colindres and his eight year old nephew Lorenzo Martinez went to farm at some distance from their house. After a long day's work they started walking home, but overcome by tiredness and nightfall, they decided to sleep by the side of the road. They were on Mount Piligüín. Alejandro rolled up his shawl as a pillow, but he had a hard time sleeping, because some hard object kept slipping under his head and making him uncomfortable. Every time he moved it out of the way, it seemed to come back. Finally, in the darkness of night he threw the thing down the ravine next to him, but soon it was back to disturb him again. At that he stuffed it into his bag. It wasn't until morning that he realized what had kept him awake during the night: a tiny figure of the Virgin with native American features, her hands folded in prayer. Once back home he handed her over to his mother Ana Caraballo and his sister Isabel Colindres. The women installed her on an altar in their house and there she was worshipped in the indigenous style for more than 30 years with daily offerings of flowers and candles. La Morenita's fame and reputation as a miracle worker spread quickly among the poor native population to whom her appearance was as important as the apparitions of the Virgin of Guadalupe in Mexico City. She was considered God's special blessing upon the indigenous peasants and laborers of the area. Whenever somebody was in dire need the Colindres family would arrive with the little statue, so that the Queen of Heaven might visit the poor soul. Our Lady was considered a purely native affair until one day an aristocratic military officer of Spanish decent, Captain Joseph de Celaya, asked the Virgin of Suyapa to cure his painful disease. He promised to build her a church and have masses held in her honor throughout the year if only she answered his prayer. When she did, the whole story of La Morenita's appearance and activity among the poor was brought to the attention of the Church hierarchy. By 1780 a chapel was consecrated and now Hondurans of all walks of life started arriving in Suyapa and receiving her blessings. In 1925 Saint Mary of the Conception was declared patroness of Honduras by Pope Pius XI. In 1969 she received the title Commander in Chief of the Armed Forces. This was because that year El Salvador briefly invaded Honduras. Since the enemy troops were better armed and trained, the Honduran boys were terrified. But suddenly they saw an apparition of their Dark Mother walking beside them, giving them water, and saying: "Onward, for we are going to win!" With that they beat the El Salvadorans back. After continuing miracles, visions, and apparitions she was declared Patroness of Central America in 1982. In the Basilica Our Lady of the Angels in Cartago, Av. 1 del Comercio before 1635, about 20 cm, carved stone. The Queen of Costa Rica is called Our Lady of the Angels because she was found on the day the Franciscans celebrate the feast of Our Lady of the Angels. During the civil war of 1833 she was named Princess of Peace. Since then Costa Rica has been one of the most peaceful countries in Latin-America, abolishing its army and founding a University for Peace. She was crowned Queen of Workers in 1956 because from the beginning she displayed solidarity with the poor and oppressed. She appeared as a small, black statue in the colored people's part of town, bent on making her home there. This was a time when strict racial segregation reigned in Latin America. Colored people not only lived in separate areas, but in Cartago they weren't even allowed to enter the city. Heaven was about to make a statement about this system. On the morning of August 2nd,1635 Juana Pereira, a dark woman of mixed blood, was gathering wood near her house when she found a Black Madonna statue sitting on a rock. She took the "doll" home and set her in a box. In the afternoon she came by the same rock and found what she thought was yet another 'doll'. Bringing her home, she realized that the first one had disappeared. The next day, passing the same rock, Juana again noticed the same 'doll'. As she brought it home and again did not find the previous 'doll' in its place, she started to realize that this was a supernatural object which kept moving back to its rock on its own accord. Now she was scared and decided it was time to hand the statue and the story over to the nearest priest. Like Juana, the Padre put the statue in a box, and as before, Our Lady returned to her home rock. The priest guessed that Our Mother didn't appreciate being stuffed into boxes, so he came to the rock with other church people to properly carry the statue to the church and place her in the sanctuary. But she disappeared again, and you know where she went! This time the people understood that the Queen of Heaven wanted her own sanctuary in the place where the dark people lived. To this day the rock on which she appeared is preserved in her basilica. So many millions of pilgrims have prayed at this rock that it is smooth from their caresses. From its base, a source of sacred water bubbles forth, which has cured many. 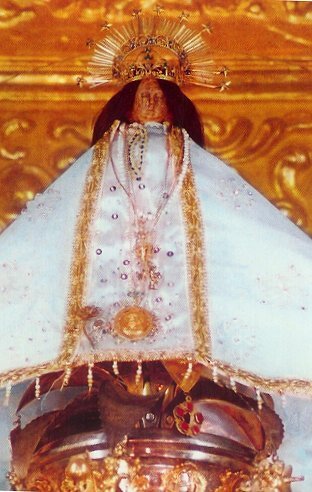 In order to spread the blessings and fame of La Negrita, Father Baltazar de Grado, the priest of Cartago at the time of Our Lady's appearance, instituted a fund to which he generously donated upon his death. This fund was committed to holding an annual celebration of the arrival of Our Lady of the Angels. Like in Einsiedeln, Switzerland a priest's money helped institute devotion to the Queen of Creation, as Costa Ricans call her. *1: www.reinadetodocreado.org A wonderful website called "Queen of all that is created". In her Santuario de Las Lajas, 7 km from Ipiales, the nearest village, in the southern Colombian Department of Nariño, 10 km from the border to Ecuador, in the canyon of the Guáitara River. About 4 ft. high, applied directly into the rock in 1754. Though this Madonna is not black she shares important characteristics with Black Madonnas. First, her eyes and hair are so black that she is revered by her devotees as “La Mestiza”, the woman of mixed Spanish and native Latin American race. She first revealed herself to and performed her first miracle for a native woman and child. So as many Black Madonnas, she too stands in solidarity with her darker, disadvantaged children. 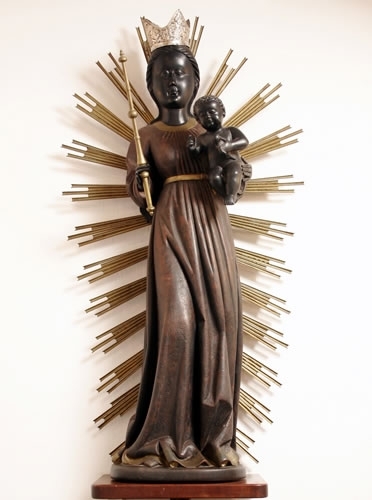 Other Black Madonnas said to have been manifested by divine hands are Our Lady of Guadalupein Mexico City, Our Lady of the Pillar in Zaragoza, etc. Thirdly, as many Black Madonna shrines, so this one too stands apart by itself in nature, a breathtaking place of natural and man made beauty. In the 18th century, Maria Mueses de Quiñones, an Indian woman from the village of Potosí, Colombia, often walked the six miles between her village and the neighboring one of Ipiales. One day in 1754 as she was approaching the bridge across the river Guaitara at a place called Las Lajas (which means flat, slippery rocks), a terrible storm came up. Frightened, the poor Indian took refuge in a cave on the side of the path. Feeling a bit spooked and alone, she began to invoke Our Lady of the Rosary, who had been made popular in the region by Dominican friars. All of a sudden she felt that someone was touching her back and calling her. She turned around, but didn’t see anyone. In terror she fled to Potosí. Days later, Maria returned once more to Ipiales, carrying her daughter Rosa, a deaf-mute, on her back in the Indian fashion. By the time she had climbed to Las Lajas, she was tired and sat on a rock to rest. The child got down from her back and started climbing around the rocks. Soon she exclaimed: “Mommy, Mommy, there is a white woman here with a boy in her arms!” Maria was shocked since this was the first time she had heard her daughter speak. She was also scared because she could not see the figures the girl was referring to. So she grabbed the child and hastened on to Ipiales. When she told friends and relatives what had happened, no one believed her. So she just took care of her business and went home to Potosí. When she came by the cave Rosa yelled: “Mommy, the white woman is calling me!”(*3) Maria still couldn’t see anything and so she hurried to take her daughter far away from this apparently haunted place. Back at home she told other friends what had happened. This time, since the path by that cave was much traveled, the news of something supernatural happening there spread quickly. A few days later, the child Rosa disappeared from her home. After looking everywhere, the anguished Maria guessed that her daughter must have gone to the cave, because the child had often said that the white lady was calling her. Maria ran to Las Lajas and was overjoyed to find her daughter kneeling in front of the white lady and playing affectionately with the child who had come down from his mother’s arms to be with Rosa. Maria fell to her knees before this beautiful spectacle; she had seen the Blessed Virgin and the Divine Infant for the first time. Fearful of ridicule from the people who had not believed her previous accounts, Maria kept quiet about the episode. But she and Rosa frequently went to the cave to place wild flowers and candles in the cracks of the rocks. Time passed, with Maria and Rosa keeping their secret. But one day the girl fell gravely ill and quickly died. The distraught mother decided to take her daughter’s body to the feet of the Lady of Guáitara. There she reminded the Virgin of all the flowers and candles Rosa had brought her and the poor mother asked the lady to restore Rosa to life. The Blessed Virgin, moved by the sadness of Maria’s unrelenting supplications, granted Rosa’s miraculous resurrection. Overflowing with joy, Maria went to Ipiales. She arrived at night time and told everyone what had happened. Those who had already gone to bed, got up, the church bells were rung, and a great crowd gathered in front of the church to hear what had happened. At daybreak everyone went to the cave. There was no more doubt about the miracle when all could see supernatural lights streaming from the cave. Going in, they found for ever engraved into the rock wall, the image of the Most Holy Virgin. Maria Mueses de Quiñones could not recall noticing it until then. It looks like Mother Mary and Baby Jesus are fishing for saints, which I guess they always are. Here, the “fishing rods”, if you will, are a rosary and a scapular. The Virgin is offering a rosary to St. Dominic, who was indeed instrumental in spreading that devotion throughout the Catholic world. Jesus is offering the scapular to St. Francis whose order spread that devotion and has had a special connection to this sanctuary from the start. (*4) (To this day, the sanctuary is under the pastoral care of the Franciscan Sisters of Mary Immaculate.) Both the rosary and the scapular are instruments of salvation and of Marian devotion. The crowns were added later by the faithful. 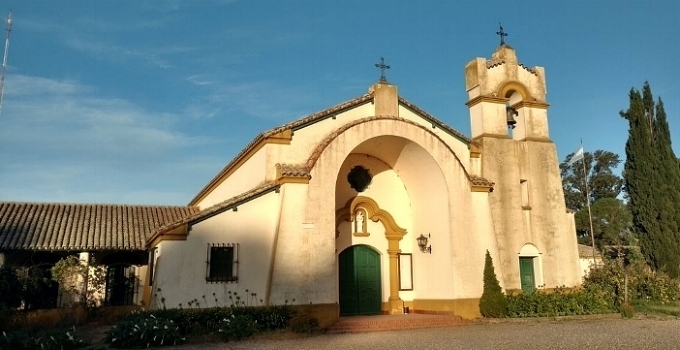 The oldest record of this holy place comes from the travel accounts of the Franciscan friar Juan de Santa Gertrudis. He was a blind monk who, between 1756 and 1764, traveled on foot from Ecuador to Nariño, Colombia, begging for money to build the first chapel in Las Lajas. At its completion, Fray Juan miraculously regained his vision, he believed, as a result of his deep faith in the Virgin Mary of Las Lajas. Over time bigger sanctuaries were needed. Today’s church was built from January 1, 1916 to August 20, 1949, with donations from local churchgoers. In the course of the centuries all these pilgrims have left countless ex-voti on the rock walls of the way down from the village into the canyon of the sanctuary. They attest to the mercy and miracle power of the Madonna. *1: Prof. Plinio Corrêa de Oliveira,” Our Lady of Las Lajas”, and Michael O'Neill, “Guáitara Canyon, Columbia (1754) : Our Lady of Las Lajas” Thank you to Michael O'Neill of "Miracle Hunters" for pointing me towards this great Madonna. *2: “Nuestra Senora de las Lajas” I have translated and slightly edited his account. * 3: Many websites summarize this story and claim the girl cried: “Mommy, the Mestiza is calling me”, but it seems like the title Mestiza was a later invention. * 4: According to the New Advent Catholic online encyclopedia’s article on the scapular “the best known scapular is that of the Third Order of St. Francis”. * 5: See English Wikipedia article on "Las Lajas Sanctuary"
*6: See Spanish Wikipedia article of "Santuario de Las Lajas"
In the basilica in her own city Aparecida do Norte, 160 km South of São Paulo, 39 cm, terra cotta, cleaned during a renovation. In 1717 three fishermen were sent to catch fish in the Paraoba River for the governor of São Paulo because it was a religious day of abstinence and he wasn't allowed to eat meat. The three companions tried and tried, but no fish were entering their nets. When they were at the point of giving up, they caught in their net the headless body of a statue of the Blessed Mother. Bewildered they continued fishing and rowing down the stream. Soon they also caught the head of Our Lady. Now that the Mother of God was on board with them, they caught so many fish that their boat almost sank. This was reminiscent of the story in Luke 5, where the disciples couldn't catch any fish until Jesus appeared and told them where to cast their nets. Soon their boats filled almost to the point of sinking. 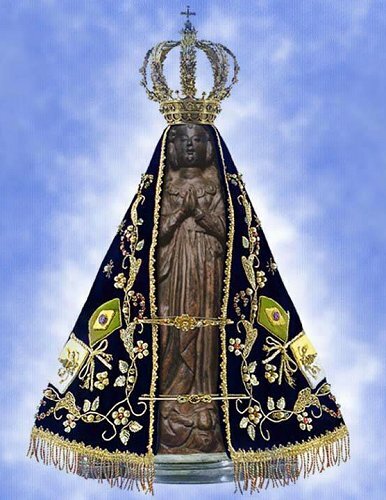 Since the Brazilian fishermen recognized the statue as the type called Immaculate Conception, they called the statue Our Appeared Lady of the Conception (Nossa Senhora da Conceição Aparecida). Our Appeared Lady was installed in the village of the men who found her and many miracles and blessings continued to gladden the whole country. In his book God-Sent: a History of the Accredited Apparitions of Mary, Roy A. Varghese retells the story of Our Appeared Lady the way the Brazilian faithful think of it:(*1) The Black Madonna was found at a time when Brazilian slaves were demanding freedom and Princess Isabel was refusing to sign their freedom act. When the Queen of Heaven intervened by performing many miracles through a "black" statue, the earthly princess saw the light and understood the message. She signed the papers abolishing slavery and offered the black Virgin a precious crown. Galland paraphrases Archbishop Dom Aloysius Lorscheider's explanation of the Virgin's title 'Mother of the Excluded of Brazil': "All who have been marginalized by conventional society are upheld and revered in the figure of this Virgin - the poor, the broken, and the dark. She is their champion. She is black because she is the Mother of All." Brazilians call her Mari-ama. Ama to them is the black wet nurse who nurses black and white children without discriminating. Pope Pius XI officially confirmed her titles in 1929.